Imagine being in a wetland. Insects chirp, reeds rustle, birds paddle along, a frog plops from a lily pad into the water where fish glide under the surface. You might even see a moose or deer coming for a drink. Wetlands, with their dry and wet areas, support tremendous biodiversity and have great ecological, cultural and economic value, says Kevin Stevens, a Wilfrid Laurier University associate professor in the Department of Biology. But wetlands and their species are under threat from climate change. That’s why Stevens is working to both protect natural wetlands and build new ones. For the last few years, Stevens has been researching at-risk wetland species with his colleague, Associate Professor Mihai Costea. One of these is scarlet ammannia, a purple-flowered plant that re-establishes from seed every year and therefore needs bare ground to germinate – but flooded ground to flourish. It is classified as endangered in Ontario. A couple of years ago, Stevens and a student went looking for the plant in Hillman Marsh, near Leamington. After checking many places by boat, they finally found a small patch on a strip of land sheltered from the crashing waves of Lake Erie. “We were thrilled because this was the second year we’d gone out looking for it and we hadn’t found it anywhere though we’d combed the entire marsh,” says Stevens. However, the scarlet ammannia they did find were in an area colonized by phragmites, or European common reed, an invasive species crowding out native wetland plants in Ontario. So Stevens came up with a conservation plan. While Stevens is cautious about drawing a direct link between these particular storms and climate change, “it is an example of how weather events can impact a species that is rare in Ontario,” he says. Wetlands excel at storing carbon, which is important for climate change mitigation. They also help stabilize shorelines, which is important because climate change is resulting in more water level fluctuations and increased storms. Wetlands also help store and purify water. However, the plants that clean water of contaminants can be also vulnerable to them. In one experiment, Stevens subjected a plant called sesbania to triclosan, an antifungal and antimicrobial agent common in soaps, shampoos and toothpaste – products we regularly wash down our drains. The results were dramatic. Even at the triclosan concentrations currently found in wetlands downstream from wastewater treatment plants, the sesbania showed severely stunted roots. As the triclosan concentrations went up, the stunting increased – and as warmer temperatures result in higher evaporation rates, the concentration of contaminants will increase, says Stevens. Stevens is working with industrial partners to construct wetlands that mimic the features of natural ones, channelling stormwater into a location where sediment can settle and microbes can break down contaminants. For example, Stevens is working with consulting engineering firm C.F. Crozier and Associates to monitor a wetland in a residential development in Halton Hills. 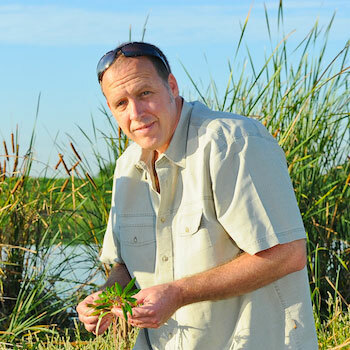 One focus of this research, which is in collaboration with Associate Professor Robin Slawson, is to optimize the performance of constructed wetlands by determining which plants are best at particular functions such as phosphorus removal. Phosphorus is a nutrient used in fertilizer that can cause toxic algal blooms – a problem being exacerbated by warmer temperatures and increased water runoff from more intense storms. Another aspect of Stevens’ research is examining how stormwater management ponds and constructed wetlands function over a full year, because even shallow ponds increasingly don’t freeze solid in the winter. He aims to take advantage of winter water flow by determining which cold-tolerant species can continue to remove contaminants even in winter. “Anything we can do to remove nutrients is something that ought to be explored,” says Stevens. A future direction of research is examining the effects of a longer growing season. Most plants go dormant over the winter but some plants are triggered to go dormant by temperature changes while others use day length, says Stevens.